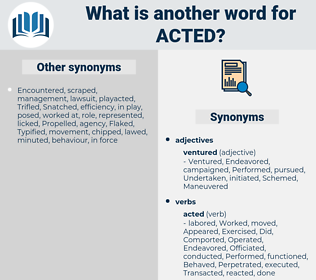 What is another word for Acted? reacted, interacted, contacted, co-ordination, accepted, Caught, intervene, Intervened, Participated, Discriminated, Operated, demonstrated, committed, Measures, cast, constituted, coordinated, coordinating, coordination, practised, Behaved, Negotiated, behaviour, reflected, Testified, directed, Interceded, resolution, acquired, Tackled, Administered, Undertook, guaranteed, Existed, facilitated, Stood, Manifested, procedures, initiated, implemented, contained, Responded, Commented, Waited, procedure, Accounted, treated, attempted, decision, endeavoured, executed, considered, Watched, Incited, functioned, functions, addressed, moved, Managed, Exercised, spoke, asserted, maintained, Carried, represented, proceed, proceedings, Proceeded, donated, moderated, engaged, Displayed, Contributed, pointed, Performed, spearheaded, Convened, Became, Talked, continued, Consisted, play, played, dispersed, Envisaged, described, completed, started, centred, stuck, gamble, Gambled, assumed, Served, handled, Resulted, Embarked, Interfered, concluded, retained, Remained, starred, Stepped, pledged, Came, arranged, supervised, Discussed, Prompted, intended, Captured, promised, called, reassured, expressed, featured, Exhibited, Told, Followed, Insisted, observed, concerned, Delivered, Wrote, work, working, Worked, Claimed, occupied, Embraced, adopted, turned, Dealt, Commenced, Caused, Replied, tabled, experienced, mobilised, honour, discharge, Appeared, Steered, Cared, strong, attended, voiced, a.i., to, processed, Occurred, Listened, Helped, Incurred, shouldered, HIT, fulfil, fulfilled, Chaired, rose, dials, Rendered, brokered, released, laid, struck, Depended, Walked, sought, placed, monitored, Reached, Aimed, Allowed, Grabbed, drew, Piloted, pursued, Offered, fort, secured, showed, Lasted, led, Ensued, proved, shot, assure, assured, Amounted, wanted, Answered, Began, included, marked, bet, Picked, applied, paid, seized, failed, used, headed, office, ensured, tried, involved, Appealed, bore, hosted, imposed, Referred, covered, Viewed, formed, Looked, Yielded, felt, Wished, Seemed, filled, Filed, Gained, ranked, Flipped, joined, Gave, rushed, Heeded, Had, drove, Ran, Brought, held, rolled, focused, saw, Went, Met, figured, edged, sounded, pulled, Meant, me, busy, hard, Did, 'd, Got, made. 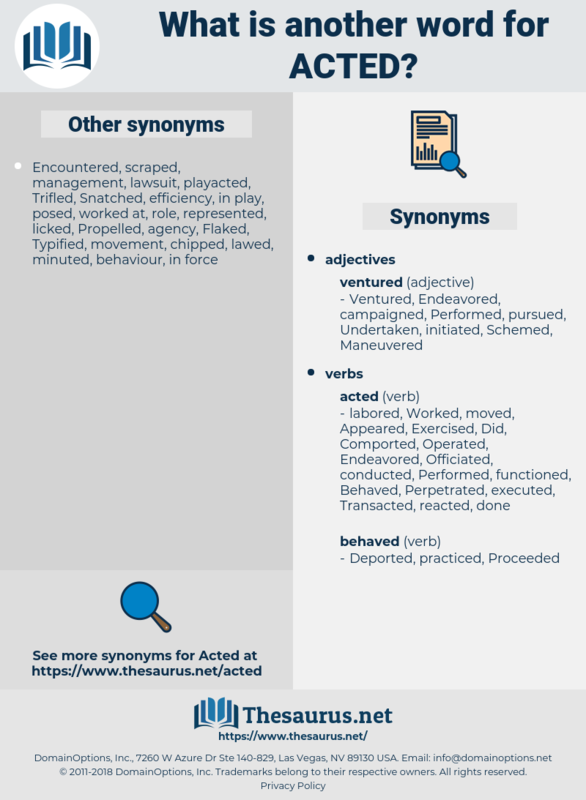 reacted, activated, Enacted, impacted, Accommodated, Perpetrated, Cooperated, accepted, Caught, Intervened, Participated, Discriminated, affected, Operated, implementation, effected, Investigated, demonstrated, accomplished, differentiated, committed, Measures, cast, Acceded, constituted, declared, tracked, practised, Trafficked, Negotiated, behaviour, accompanied, Furthered, directed, respected, campaigned, pursuant, acquired, Adjudicated, allocated, Drafted, response, Tackled, Undertaken, motivated, Administered, guaranteed, incorporated, constrained, facilitated, dedicated, ascertained, populated, transposed, stimulated, confiscated, taught, initiated, implemented, Responded, procedure, Curtailed, Accounted, persecuted, treated, attempted, endeavoured, executed, complemented, classified, considered, functioned, Substituted, Achieved, addressed, moved, course, traded, Managed, Exercised, assisted, maintained, Carried, represented, appointed, serviced, confirmed, proceed, donated, established, governed, engaged, evidence, encouraged, triggered, decided, utilized, Displayed, Contributed, pointed, consumed, Performed, preoccupied, Influenced, encumbered, Prosecuted, Issued, Complied, breached, become, ratified, spoken, Channelled, formulated, Mobilized, composed, trapped, Comprised, Emerged, Talked, continued, supported, play, played, charged, Exerted, enforced, completed, Fared, started, come, determined, Conformed, centred, settled, utilised, prepared, stuck, Deployed, assumed, satisfied, Served, handled, granted, proof, Resulted, Embarked, staffed, resolved, Enabled, concluded, Approached, elaborated, Progressed, Remained, Introduced, Shown, Translated, Stepped, Supplemented, Lacked, arranged, Discussed, Surfaced, intended, Captured, called, absorbed, Superseded, supposed, obligated, attained, featured, stopped, Regarded, Exhibited, Followed, finalized, ruled, Adhered, replaced, observed, concerned, pronounced, invested, Delivered, abided, Worked, Claimed, disposed, occupied, Embraced, Fought, Disbursed, adopted, taken, reply, turned, Entailed, obliged, Dealt, chosen, honoured, discharged, Harvested, assigned, Caused, Replied, Greeted, tabled, experienced, mobilised, ordered, Arisen, Obtained, realised, Appeared, guided, follow-up, Favoured, welcomed, tested, devoted, Cared, desired, attended, Procured, developed, stated, risen, processed, Occurred, Helped, Incurred, Undergone, permitted, Succeeded, shouldered, realized, fulfilled, received, checked, Prevented, Upheld, Rendered, impeded, Submitted, released, laid, Quoted, struck, solved, punished, grown, vested, sought, placed, monitored, Reached, Aimed, finished, drawn, Levelled, Been, Allowed, delayed, pursued, Wielded, Happened, Exported, secured, showed, Promoted, Launched, employed, led, proved, proven, assured, wanted, Answered, included, marked, Begun, Picked, curbed, insured, stunted, fallen, applied, fostered, paid, produced, seized, failed, Entered, Pushed, Borne, used, Enjoyed, Hampered, office, ensured, tried, required, involved, imposed, arrested, braked, Viewed, known, formed, Looked, favored, Yielded, halted, designed, blocked, handed, given, run, Passed, bound, Seemed, filled, Filed, Gained, joined, spent, Hindered, heard, Heeded, Had, Has, Brought, Lodged, held, found, focused, gone, missed, seen, Met, figured, Slowed, kept, Sued, Meant, based, done, Gotten, Got, made. How could they do otherwise when Cecilia acted as she did? Why don't you ask me what I thought the day you acted so beautifully at Crawling Stone Ranch? acedia, assist, acquit, azide, aesthete, acquitted, actaea, associated, august 15, actuate, axe head, aghast, Agua Toad, agueweed, accused, acadia, 15 August 1945, aught, asset, aikido, acheta, as yet, ask out, actuated, agitated, asat, astute, augusta, augite, acuate, ague weed, agouti, acaudate, assiduity, assisted, aside, azido, august 1, acid, acid head, acidity, acuity, ascot, august, agate, axseed, aged, acute, august 6, acth, Asadha, accede, associate, act out, aguacate, azt, Azo Dye, azote, accost, access code, acetate, acid dye, ax head, agitate.